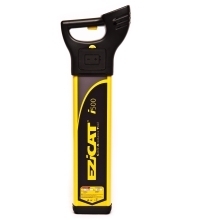 The New EZiCAT i500 represents the latest design in cable location technology. With state‐of‐the art digital signal processing (DSP) and intelligent software, the EZiCAT i‐Series locators make ground surveys a simple and speedy task; increasing onsite safety and ultimately saving time and money. The EZiCAT i500 locates buried conductive services by receiving electromagnetic signals which radiate from them. The EZiCAT’s intelligent software interprets the signals and provides the operator with an audible and visual response to the position and direction of the buried services.